MP Roland Mugume (right) with FDC secretary for mobilisation Ingrid Turinawe. The Opposition legislators say Ugandans have no reason to complain because it is them who vote for the greedy leaders. Courtesy photo. KAMPALA–The Opposition caucus in Parliament has blamed the political tension over the presidential age limit on the electorate. The opposition leaders were addressing journalists yesterday as they announced plans to embark on a campaign against the proposed amendment of article 102(b) of the Constitution that imposes an upper age cap of 75 years on presidential aspirants. The MPs were led by Roland Mugume, the acting leader of opposition. He was flanked by MPs Betty Aol Ochan, Florence Namayanja, Sempala Kigozi, Gohanahasa Francis, Robert Centenary and Julius Ochen, among others. Julius Ochen, the Kapelebyomg MP, said even though there is a public outcry against the proposal to remove presidential age limits, the public have no one to blame but themselves. He told journalists that the electorate are easily bribed during elections and end up voting selfish leaders. “They were part and parcel of putting this man there, and part and parcel of voting those people who are running after money…….. Ugandans have no reason at all to complain about what is going on in this country,” he fumed. The Igara west MP Raphael Magyezi is expected to table a private members bill tomorrow intended to remove the presidential age cap. The move will allow President Museveni who will be over 75 years in 2021 to seek a sixth term. A vast majority of NRM MPs are believed to have endorsed a proposal to support this amendment, a decision that has been viewed as a betrayal since it would, according to the opposition, entrench Museveni in power for life. The MPs also condemned the criminal summons issued against MPs opposed to the proposed amendment. 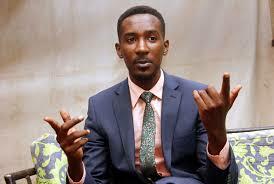 Allan Ssewanyana is one of the MPs who appeared for questioning at Kibuli police headquarters yesterday. Courtesy photo. MPs Muhammad Nsereko, Theodore Ssekikubo, Barnabas Tinkasimire and Allan Ssewanyana were summoned to appear today before the Criminal Investigations Department in Kibuli over statements made in relation to the proposed removal of the presidential age limit. The caucus has declared the action by police as a violation of the Parliament Powers and Privileges act 1955. Rukungiri Municipality MP Roland Mugume notes that for police to summon any MP to appear for interrogation for a statement made at Parliament during the course of their work is unacceptable. “It amounts to interference of the independence of parliament,” he said. He noted that surrounding Parliament with armored vehicles and anti-riot trucks is also intended to rob parliament of its independence and is a repeat of 1966 events where then president Milton Obote intimidated parliament to accept the pigeon hole constitution that abolished traditional kingdoms. “Fifty five years later Museveni is doing exactly the same while removing age limits,” Mugume said. “We call upon all country men to join us to make life impossible for all people who want to allow Mr Museveni to extend his political life beyond 75,” he added. The FDC stalwart noted that the opposition has devised a plan to defeat any attempt by the NRM to introduce the bill on the floor of Parliament. The Kabweri county MP Gohanahasa Francis stated that the age limits were introduced by the late Col. Noble Mayombo during the Constituent Assembly in order to lock out possible opponents like former president Dr Milton Obote. “When Obote was around just mentioning his name in the corridors of power sent shock waves to the politicians at the time because he was popular among the people,” he noted. 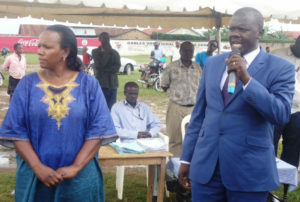 The Maracha county MP Oguzu Lee Denis stated that the views of NRM MPs from West Nile, Koboko Municipality MP Evelyn Anite and Arua Municipality MP Ibrahim Abiriga who are in support of the amendment are not the views of the people of West Nile since they have never consulted the people. “I don’t know why they want to put the future of this country at stake,” he explained.